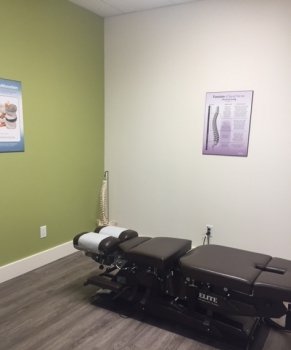 At Attune Chiropractic Centre, we use a wide array of effective chiropractic techniques and services to meet all the needs of you and your family at one convenient location. We use a variety of techniques to meet your needs. An Acvivator is a small tool that gives a quick impulse to a restricted joint. It effectively restores motion in joints with no pain . ART is an effective technique to relieve muscle tightness and spasm. This slow stretch can offer relief from low back pain as well as pain that refers down into the legs. It also increases your lumbar ranges-of-motion and increases fluid into your lumbar discs. We use High Velocity – Low Amplitude (HVLA) adjustments to restore movement in the spine and other joints. These adjustments are quick and light, and are painless and safe. This is the most common technique that we use at Attune Chiropractic Centre. All of our Chiropractic tables are designed with drop pieces. These drop pieces can be used to help restore motion in restricted joints by using the momentum/gravity of the drops so that the patient feels only a little pressure. This technique can help alleviate low back pain and discomfort associated with pregnancy and turn a baby from it’s breached position for an easier delivery. Studies have proven high success rates for turning breech babies through relaxing the intrauterine constraint. The Journal of Manipulative and Physiological Therapeutics reported in the July/August 2002 issue an 82% success rate of babies turning vertex (head down) when doctors of chiropractic used the Webster Technique to relieve intrauterine constraint. It is a safe and non-invasive gentle technique. BioFlex Laser Therapy is used to treat a variety of conditions. 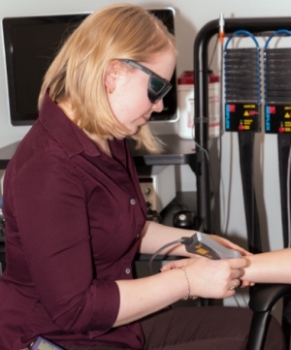 BioFlex Laser Therapy is a Low Intensity Laser Therapy technique that can help alleviate pain in a variety of different conditions. Check out www.bioflexlaser.com for more information. We refer our patients to our massage therapist on an as-needed basis. We work with the therapist on your case so they know what areas of your body need attention. We offer KinesioTaping by Dr. Allison, which can be added to your chiropractic treatment plan or done as a sole treatment. We also have rolls of tape available for purchase. We offer counseling on different supplements that can help in your overall well-being. We have Adeeva Bone Support Formula enriched with calcium, magnesium and vitamin D as well as Adeeva Glucosamine Joint Formula which contains MSM and high potency bromelain. Our chiropractors might suggest one of these supplements for you to improve your overall health. Our orthotics are custom made using a cast and a gait analysis. We carry MediFlow Waterpillows and Normalizer contour pillows. Posture Medic is a postural device that help improve your posture, it helps strengthen your back and core muscles. To find out more, you can also consult www.posturemedic.ca. We carry Orthogel and Biofreeze for topical pain relief both during your appointment or at home. Are you ready to find out what we can do to optimize your well-being? Contact us today to find out.